A focused, practical reference designed to help practitioners draft, prosecute, and manage a strong portfolio of electronic and technology patents. This step-by-step strategy guide helps practitioners deal with today’s lightning-paced technological developments, changes in USPTO policy, and pivotal court rulings. 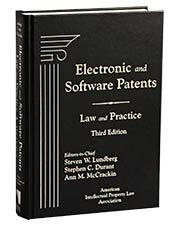 In addition the Fourth Edition of Electronic and Software Patents includes perspectives and tactics, including guidance on tough decisions regarding patent protection, prior art, strategy, and drafting claims; lessons on preparing computer-related patent applications; insights on drafting with the appropriate scope; practice “tips and traps” for each step of the patent prosecution process; international drafting and prosecution strategies for Japan, the United States, and Europe, and where to file first; working with business method patents and design patents; in-house patent portfolio development; noninfringment and invalidity opinions; design-around techniques, and litigation of software patents.